There are some great beds out there, but none has ever been developed by a Sleep Doctor. His first book, GOOD NIGHT: The Sleep Doctor’s 4-Week Program to Better Sleep and Better Health (Dutton/Penguin), an Amazon Top 100 Best Seller, has been met with rave reviews and continues to change the lives of readers. It is now available in paperback as BEAUTY SLEEP: Look Younger, Lose Weight, and Feel Great Through Better Sleep. As the subject of sleep gains greater momentum in our sleep-deprived society, Dr. Breus has become a widely recognized leader in this highly evolving field. Dedicated to raising awareness of both sleep disorders and what he calls “disordered sleep” in the public and healthcare communities, Dr. Breus is on a mission to develop innovative education and communication programs. In addition to his private practice where he treats athletes, celebrities and the like, he also trains other sleep doctors and consults with major airlines, hotel chains, mattress manufacturers and retailers to provide the optimum sleep experience for their customers. His audio relaxation CD distributed in Crowne Plaza Hotels helps millions of people fall asleep each year; and for over 10 years, he has served as the Sleep Expert for WebMD Health, a leading Internet site for health-related information and pens “Sleep Matters” a monthly column in WebMD magazine. You can also find him on AOL where he is a Wellness Coach discussing topics from mattress choice to sleep apnea. His blogs can be found at WebMD, The Huffington Post, The Insomnia Blog, Psychology Today, MedPedia, Organized Wisdom, SleepBetter.org, and Furniture Today. Dr. Breus has provided editorial services for numerous medical and psychology peer-reviewed journals and has given hundreds of presentations to professionals and the general public. Among his numerous national media appearances, Dr. Breus has been interviewed on CNN, Oprah, The View, Dr. Oz and The Doctors. He also appears regularly on Sirius XM Radio. Dr. Breus’ PBS television special, “Good Night with The Sleep Doctor,” debuted in December 2007 and continues to air nationwide. 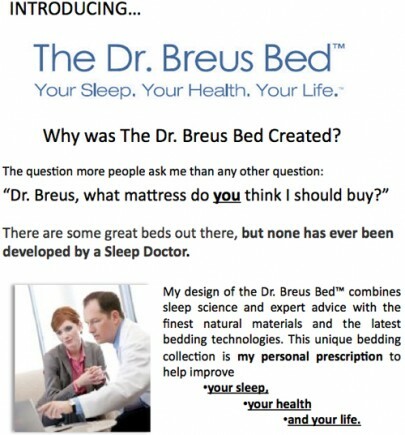 In August 2008, Dr. Breus debuted his show “As Recommended by The Sleep Doctor,” on the Home Shopping Network (HSN). Welcome to the Sleep Doctor House Call Program, the exclusive program for owners of The Dr. Breus Bed™. Congratulations on your purchase of a new sleep surface, taking the first step to better sleep, better health and a better life. Through the Sleep Doctor House Call Program, Dr. Breus will serve as your personal, expert guide and coach through any transition time you may need from your old mattress to your new sleep surface – The Dr. Breus Bed™. You’ll receive important information, educational resources and tips to help you get a better night’s sleep, improve your sleep health, and provide you with special opportunities in the future. The Sleep Doctor is IN – and Dr. Breus is ready to make a House Call. Enroll with the special code you received in the First Night Kit box you received when you purchased your mattress, and you will take the next step towards your better night’s sleep. 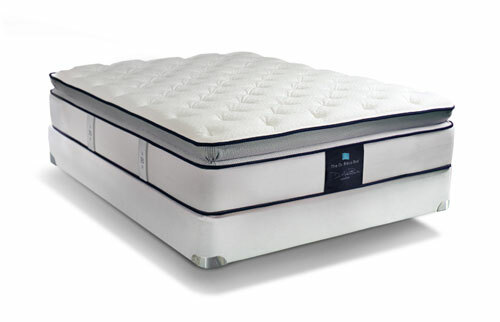 is a unique, proprietary combination of a special natural Talalay latex and a fabric infused with a natural, vegetable oil based phase change material. tempsense™ works to automatically keep the sleep surface underneath you in the ideal comfort zone all through the night! As you get warmer, the molecules spread out to dissipate your heat, and as you cool, the molecules contract to trap the heat energy. tempsense™ is creating thermo-neutrality even through the most popularly used protective mattress pads.